I wanted to write today about how changes to routines and new transitions affect our little ones. We all know how much they thrive on routine and with school ending a few weeks ago, I have noticed the routine change affect Elijah. He has been acting out a lot more and pushing us to see what he can get away with. Then today he started ESY (Extended School Year) which will be a regular school program for the next 6 weeks. Its tough because he was just getting used to being out of school, now he’s back for 6 weeks, then he will be out for 3-4 weeks and then the regular school year will begin. This may not seem like a lot, but making these transitions can be overwhelming. We met with his new teacher, aides and speech therapist yesterday and I got the opportunity to speak to a few of the other moms. It was nice to speak to parents who can relate and understand what it’s like to do all of this everyday. 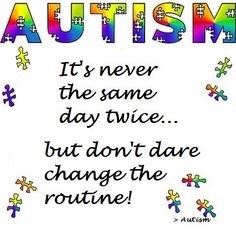 It was also an eye-opener to how autism can be so different from person to person. One of the moms said her son disliked crowds, another mom said her son will not play or speak to a new person for a long time, and I told them how Elijah gets overwhelmed when he hears beeping sounds. They just understood and no one tried to make the other feel better because there is really nothing we can say to do that. We just talk about that’s happening because for us, it’s so routine. I know that when Elijah hears a beeping sound (i.e. At the checkout counter or over the intercom at school), he will start hitting his ears and rocking back and forth. I have found that speaking to him in a calm voice will sometimes distract him from the sound and stop the anxiety he is having. But to be honest, sometimes nothing helps and we just have to wait it out. Change in routine can be tough to deal with but there are some positives I’ve noticed. Elijah does eventually learn to adjust and its good for him to know that not everything happens in the proper way or how he wants it. If we have everything always according to plan and later on there is change, he could have a major meltdown. Small changes to routine can be beneficial and we just have to hang in there!